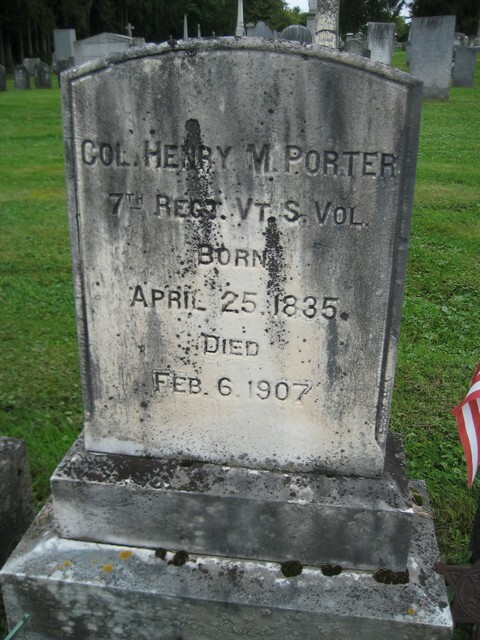 The remains of Col. Henry Martyn Porter, M(iddlebury College)' 57, who died in New York city Wednesday, February 13, 1907, were brought to Middlebury, Vt., Friday and buried from St. Stephen's Church. Rev. Mr. Carpenter, rector of St. Thomas' Church of Brandon, officiated in the absence of Rev. W. T. Forsythe, and John H. Stewart, C. C. Wells, Charles M. Remele, J. Edwy Buttolph, Eugene Twitchell and J. A. Fletcher acted as bearers. William H. Porter, president of the Chemical Bank of New York and a former resident, and C. P. Kitchel came with the remains. Col. Porter was born here in 1834 and graduated from Middlebury College with the class of 1857. 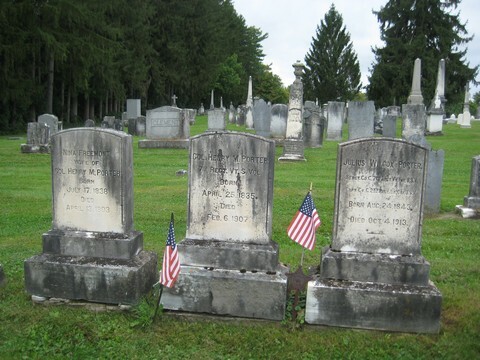 He taught school in Southerland Falls, Proctor, in 1857; in Rupert in 1858-1859; was a merchant in New York from 1859 to 1861; was private in the 7th Regiment, New York National Guards in 1860-1861; Captain 7th Regiment Vermont Volunteers, 1861-62; major, same, 1862-65; lieutenant colonel, 1865-66; was connected with the National American Bank Note Company, 1867-1894; Mail and Express, 1894-97; North Western Mutual Life Insurance Company, 1899; Hamilton Bank Note Company, 1899. Col. Porter married Frances Cornelia Fremont, a daughter of the late Gen. John C. Fremont, (Pathfinder) July 28, 1864. The burial was in the family lot in the West cemetery. A delegation of W. P. Russel Post, G.A.R., attended. -- Clipping. Henry Martyn Porter, New York, N. Y. - Business. He is connected with the American Bank Note Company, having had charge of one of its Departments for twenty-two years. Private, 7th Reg. N. Y. National Guard. Captain, Major, Lieut.-Col-onel and Colonel 7th Reg. Vt. Vols. Provost Marshal, City and Parish of New Orleans, 1863-1864. Address, 86 Trinity Place. A. M.
Source: Thomas E. Boyce, Catalgue of the Officers and Alumni of Middlebury College in Middlebury, Vermont, (The Register Co., Middlebury, 1890), p 110.